Between 21st April 1944 and 15th April 1945 a concentration camp operated on the grounds of the pioneer barracks of Melk. With approximately 14.390 prisoners who were forced to work here in the course of one year it was one of the biggest satellite camps of Mauthausen concentration camp and the biggest satellite camp in Lower Austria. The camp prisoners came from more than 20 countries and their work consisted primarily of digging an underground tunnel complex in the Wachberg hill which is situated between Melk and Loosdorf. In the tunnels created by the camp prisoners the Steyr-Daimler-Puch Company produced war material (mainly ball bearings) as of late fall of 1944. At least 4.874 camp prisoners died in the camp or at the construction site, and more than 3.500 corpses were burned in the crematorium which was built for that reason in the fall of 1944. The former crematorium building was declared a public monument in 1962 and has been the home of the Melk concentration camp memorial ever since. The current contemporary historical exhibition in the rooms of the memorial was created by Bertrand Perz and Gottfried Fliedl in the early 1990s. Since 1994 the association “MERKwürdig. Eine Veranstaltungsreihe wider Gewalt und Vergessen” (reMARKable – event series against violence and oblivion) has been in charge of the memorial. MERKwürdig also regularly organizes events with which they strive to deal in a critical way with topics like violence, racism and right-wing extremism. Under “downloads” you find references and important general reading material (available in German, English, French and Italian) concerning the history of the satellite camp of Melk for a free download. As producer of extremely important war material the Steyr-Daimler-Puch company was a high priority target for the Allies. Several aerial attacks on German ball bearings production sites – among others also in Steyr-Münichholz in February and April 1944 – led to a quicker relocation to underground sites. Towards the end of the war the shortage of manpower in the German war economy was already so advanced that the construction of underground sites was only possible by the massive use of concentration camp prisoners. Unlike the Nazi regime, Steyr-Daimler-Puch was interested in building underground production sites with the help of thousands of concentration camp prisoners not only to continue the armaments production. In underground production facilities major production capacities could be ensured well after a possible and more and more foreseeable end of the war. Thus the concentration camp prisoners also worked in those underground construction projects for the post-war interests of the industry. Near the village of Roggendorf in the Wachberg hill which consists primarily of quartz sand an underground production site was planned under the code name “Quarz”. The site’s tunnel system was to have a production area of 65.000 m2. As workers for the construction of this underground armaments factory concentration camp prisoners were to be used. So, after first considering to build huts directly near the tunnel construction site in Roggendorf, a concentration camp was established in the then unoccupied Birago Pioneer Barracks of Melk. On 21st April 1944 the first transport with mostly French prisoners arrived at the concentration camp of Melk. The prisoners were initially housed in the so-called “object X” and later on the whole area of the barracks. Until April 1945 14.390 persons were deported to Melk which became one of the biggest concentration camps on Austrian territory. In January 1945 the number of prisoners reached its peak with more than 10.000 men interned in the tightest of spaces under terrible conditions in buildings of the former barracks and newly erected huts. Along with the “Anschluss” in March 1938 the German Reich started also in Austria to quickly adapt and expand the industry for armament purposes. At that time the Steyr-Daimler-Puch AG was one of the biggest metalworking companies in Austria. Already in 1938 it was incorporated into the Reichswerke Hermann Göring and expanded with financial help of the most important sectors of the armaments industry. It then produced military vehicles, motorcycles and bicycles, rifles and submachine guns, tanks, aircraft engines and ball bearings. Because of the German military build-up, the production of ball bearings had rapidly increased since 1933, and during the Second World War the aircraft industry became the single most important customer for ball bearings. The Nazi regime and the arms manufacturers responded to the shortage of workers caused by the war by massively making use of foreign civil workers and war prisoners, and as of 1942 by forcing concentration camp prisoners to work. To this effect many satellite camps were established around already existing concentration camps. Until the end of the war Mauthausen, the first concentration camp erected on Austrian territory in August 1938, had up to 40 subcamps whose prisoners were primarily used as forced laborers in the armament industries and the construction of production sites. As of 1941/42 Steyr-Daimler-Puch was the first armament factory to use concentration camp prisoners in its production sites on Austrian soil, e.g. in Steyr-Münichholz where a satellite camp of Mauthausen concentration camp existed as of March 1942 for that purpose. „Soup in the Tunnels“ – drawing by concentration camp survivor Daniel Piquée-Audrain. Source: scan by Perz, “Projekt Quarz”. The 14.390 all male prisoners who were forced to work in the satellite camp of Melk came from more than 26 different countries. The largest national groups consisted of Poles, Hungarians, Frenchmen, Soviet citizens, Germans, Italians, Greeks and Yugoslavs. Because of the incomplete source material, the share of the respective national groups in the total number of prisoners in Melk can only be determined approximately. About 35-40 percent of the concentration camp prisoners came from Hungary, 25-30 percent from Poland, 10 percent from France, 5 percent from Germany (incl. Austria) and the remaining 15-25 percent from the other nations. Most of the prisoners were put in the concentration camp because of political or racial reasons, about a third of them were classified as Jews. All of the prisoners were transported to Melk on request of the companies Steyr-Daimler-Puch and Quarz to be forced to work in the tunnel construction, and sometimes the headquarters in Mauthausen couldn’t even provide the number of forced laborers required by the armaments industry. Among other things, this was a reason that, the longer the camp existed, the more the question of “physical ability to work” faded into the background. In January 1945 119 children under the age of 15 years were transferred to Melk for forced labor. Although month after month hundreds of prisoners died because of the extremely bad living and working conditions or were brought back to the main camp of Mauthausen due to “inability to work”, the number of prisoners in Melk rose to more than 10.000 by the end of January. For comparison: at the beginning of the Second World War in 1939 the town of Melk had a population of 4.670, on 1st January 2017 it was 5.390 persons. The chances for survival of the individual prisoners in the camp depended primarily on racial criteria according to which the SS behaved differently towards prisoners. While prisoners of German origin were on the upper part of the scale, followed by prisoners coming from North or West European countries, Poland or the Soviet Union, prisoners of Jewish faith and so-called “gypsies” – regardless of their nationality – found themselves on the lower part. In satellite camps like Melk which were oriented towards forced labor for the armaments industry, the scale had a certain permeability, if a person had special professional qualifications. Skilled craftsmen tended to have better positions within the camp society than unskilled workers. The former Melk camp prisoner Shaul Schpilmann describes his experiences as a child in the concentration camp. Transports of prisoners from Mauthausen concentration camp to Melk were organized according to the needs of the building companies who constructed the tunnel complex near Roggendorf. Most prisoners were deployed in shifts directly for the tunnel construction. The prisoners of Melk concentration camp were “hired out” to the building companies by the SS camp direction. Every company declared how many workers they needed on a given day and according to these statements the worker gangs were put together. The SS charged the companies 6 Reichsmark for every prisoner-worker and 4 Reichsmark for every unskilled worker. The money was then transferred to the Reich Treasury. The “underperformance” of prisoners compared to German civil workers was reimbursed to the companies. What the companies could squeeze out of the workers beyond the stipulated “minimum performance” was their gain, so the prisoners worked around the clock in three shifts. The use of concentration camp prisoners meant a crucial advantage for the building companies, because without the prisoners it wouldn’t have been possible for them to generate any turnover. After the war many companies refused compensation payments, arguing that the respective remuneration payments had been made and that the prisoners had already been paid. The concentration camp prisoners were brought to their daily forced employment from Melk to Roggendorf by train, regardless of weather conditions. Both in Melk (near the old sports grounds in the Abt-Karl-Strasse) and in Roggendorf, special loading platforms were built for that purpose. If a train was late, the prisoners often had to wait outdoors for hours. The former Melk concentration camp prisoner Franz Schikora describes his memories of the forced labor in the Roggendorf tunnels. Scan of a page of Melk’s Book of the Dead. Source: National Archives, Washington. Within a year 4.874 prisoners lost their lives in the satellite concentration camp of Melk. About a third of the fatalities were prisoners of Polish and Hungarian origin, approximately 11 percent were French. The death rate was disproportionately high among the Jewish prisoners: they represented a third of the prisoners, while about 42 percent of the fatalities were categorized as Jewish. There are several reasons for the extremely high death toll in the satellite concentration camp of Melk: hard physical labor; a high work pace and many accidents during the forced work (which was considered essential to the war effort) in the tunnel complex in the Wachberg hill in Roggendorf; malnourishment and inadequate clothing; the housing situation on the grounds of the Birago barracks as well as constant maltreatment by guards, prisoner functionaries and civil workers. In addition to deaths due to illness among the severely weakened concentration camp prisoners, there were deliberate murders, including those committed by SS member Gottlieb Muzikant, a medic in Melk’s sick bay, through lethal injections. More than 200 prisoners were also killed in July 1944 in a bombing raid by the Fifteenth US Air Force. Until the end the SS tried by all available means to prevent the liberation of surviving concentration camp prisoners by the Allied forces. The advance of the Soviet army led to Himmler’s order to evacuate all camps at the approach of enemy troops and to transfer the prisoners to other concentration camps situated further to the West. During forced evacuation marches, in transport trains which didn’t arrive at their destinations for days and in overflowing reception camps ten thousands of concentration camp prisoners lost their lives. As of end of March 1945 the preparations to evacuate the concentration camp started. Plans to drive the prisoners into the “Quarz” tunnels and to murder them by blowing the tunnels up were not carried out. Between 11th and 15th April 1945 the remaining 7.401 surviving prisoners of Melk concentration camp were transferred to the main camp of Mauthausen and the satellite camp of Ebensee. In the camp in Melk at least 30 seriously ill prisoners who were not fit for transport were murdered by members of the SS and prisoner functionaries shortly before the shutdown of the camp. At least 36 other prisoners lost their lives during the evacuation transports. With the liberation of the concentration camps of Ebensee und Mauthausen by American troops on 5th and 6th May the survivors of Melk concentration camp were also liberated. Already in the first days after the liberation of Mauthausen concentration camp the US authorities began investigating potential Nazi criminals and imprisoned thousands of SS members and former prisoner functionaries in detention camps. In the following months the French, British and Soviet occupiers also started investigations in their respective zones and searched for suspicious persons. At the same time limited-term special national legislation was created in many European countries like Poland, Czechoslovakia and also Austria to punish Nazi crimes. The crimes committed in the satellite concentration camp of Melk were addressed not only by military tribunals of the Allied Forces, but also by courts on a national level. In total more than 20 former members of the camp administration and guard detail (primarily members of the Luftwaffe) as well as former prisoner functionaries and civilians were tried, among them the camp commandant Julius Ludolph and the head of the supply magazine Otto Striegel. They were found guilty during the Mauthausen camp trials held by an American military government court on the grounds of the former concentration camp of Dachau in May 1946 and hanged one year later in Landsberg am Lech. In 1947 and 1949 respectively the former Melk concentration camp kapos Fidel Balbas and Uli Schmidt were found guilty by a French military tribunal in Rastatt of murdering several of their fellow prisoners by severely mistreating them and were also executed. The SS medic Gottlieb Muzikant who was responsible for numerous murders in the prisoner sick bay in Melk was also convicted. In 1960 the regional court in Fulda in the Federal Republic of Germany gave him 21 life sentences. The People’s Court of the regional court of Vienna closed three trials related to crimes committed in the satellite concentration camp of Melk with a verdict: civilian Edmund Schödl who worked as electrician for the company Felten und Guilleaume in Melk was sentenced to three years of prison, the former unterkapo Josef Fischer was acquitted and Franz Höger, a Wehrmacht platoon leader who was in charge of guarding the prisoners, was given ten years of prison. Upon their arrival in Melk the Red Army found the former satellite concentration camp deserted and used the grounds for a short time as a Soviet military base. Between January 1946 and the end of 1948 the barracks were used as temporary accommodation for about 70.000 resettlers, ethnic Germans from Southern and Southeastern Europe (so-called “Volksdeutsche”), who were subsequently transported to Germany. While the grounds of the barracks were used as a garrison again by the Austrian Armed Forces as of 1956, the area of the former crematorium was already in the first post-war years in danger of falling into ruin. This development attracted the attention of the Austrian Concentration Camp Association (KZ-Verband) in 1948, and the community of the French former concentration camp prisoners, the Amicale de Mauthausen, also criticized the bad condition of the building. Already in 1949 the Amicale put up a commemorative plaque during one of their “pilgrimages”. On 2nd July 1950 the town of Melk was put in charge of the premises on which the crematorium building is located – not least because of the intervention of Mr. Marie Émile Antoine Béthouart, the High Commissioner for France in Austria. 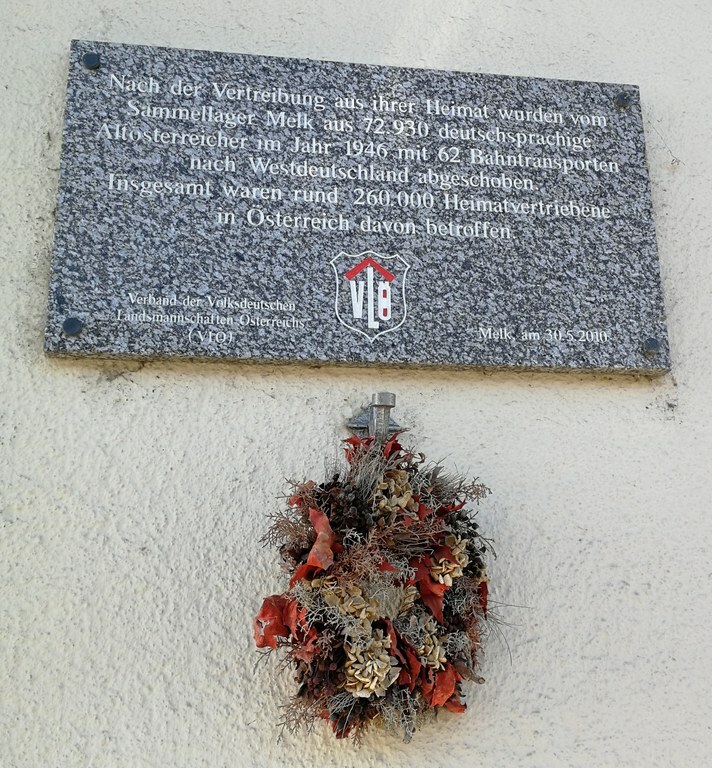 In 1951 the Lower Austrian Concentration Camp Association started with maintenance work and installed the first Austrian commemorative plaque. Eleven years later the grounds were officially declared a public monument and adapted as a memorial. In the following years many more commemorative plaques were put up outside the building as well as in the crematorium room. The scientific reflection about the history of the satellite concentration camp of Melk started only many decades later. In the 1980s Bertrand Perz dedicated his thesis to the camp history of Melk and afterwards he developed, together with Gottfried Fliedl, the first permanent exhibition in the rooms of the crematorium which can still be visited there today. Make sure to visit „downloads“ where you find references and important general reading material (available in German, English, French and Italian) concerning the history of the satellite camp of Melk for a free download. In the region around Melk Memorial and the museum ERLAUF REMEMBERS there are a few visible, but also lesser known and sometimes nearly forgotten places of remembrance. The project "Zwischenräume" (interspaces) is dedicated to many of these historical sites of National Socialist crimes and to the challenges of a changing culture of remembrance. Together with Melk memorial and the museum ERLAUF REMEMBERS Zwischenräume addresses the forced labor in the tunnels under the Wachberg hill near Roggendorf, the massacre of Hungarian Jewish forced laborers in Hofamt Priel, the forced labor in the HITIAG spinning mill in Golling an der Erlauf as well as the resistance against the Nazi regime by a group from Pöchlarn and also the creation of the Peace Cross Memorial in St. Lorenz.